Pinterest has launched a new ‘skin tone’ feature that lets people discover personalised makeup and hair ideas on the go with better search parameters. 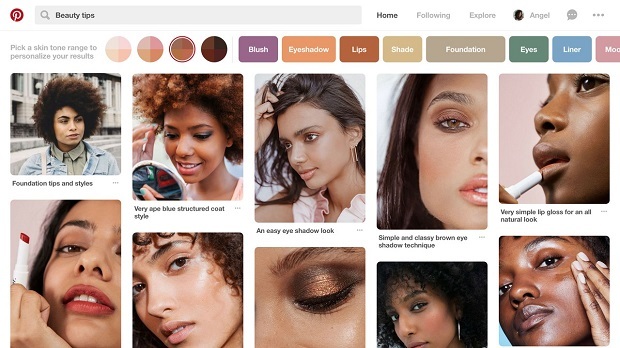 In April, Pinterest began testing in the US skin tone ranges, an inclusive search feature on the web to narrow beauty results, and since have made machine learning and recommendations improvements. Over the coming weeks, when US Pinners search for makeup and hair ideas on iOS, a palette will appear to narrow the search, so they can see more personalized Pins and videos as results. Each palette represents a range of skin tones, with more to come. More information can be found in our Newsroom (copied below) and images here. Last year, nearly 60% of the top 100 search terms for skin-related searches involved a tone, such as dark skin, pale skin, and olive skin, which showed Pinterest that women of all skin types wanted a way to customise their searches. This feature is a result of Pinterest’s technical and Inclusion & Diversity teams working closely together. As Pinterest recently shared in its annual diversity report, the company is committed to growing an employee base that understands and reflects the world it wants to serve. By combining the latest in machine learning and more inclusive product development, Pinterest is able to directly respond to Pinner feedback and build a more useful product. •	Billions of beauty Pins have been saved to Pinterest. •	“Beauty” is one of the most searched categories. •	Women on Pinterest are 2.4x more likely to experiment with different makeup, compared to women on other platforms. •	Recent beauty trends include “glossy makeup” (searches +89%), stand-out lip colours (searches +467%), or “going gray” (+879%), which will now result in more customisable searches across platforms. This feature is a result of the technical and Inclusion & Diversity teams working closely together. As recently shared in the company’s annual diversity report, Pimnterest said it is committed to growing an employee base that understands and reflects the world we want to serve. The social media scrapping site also used feedback from popular Pinners like Priyanka who use Pinterest to find traditional Indian beauty, fashion and style ideas. And Alejandra Ramos who as a Latina woman finds beauty ideas and products that look and feel relevant and accessible, and Vic Styles who enjoys discovering beautifully curated content on Pinterest with the click of a button. Pinners in the US will see an iOS update for their app in the coming weeks followed by Android and available globally in the future.